Iceland is basically a giant pasture for grazing animals (sheep mostly). The unique landscape affords some mountainous hikes, and it’s not uncommon to see a farm built right up into a cliff, with half-barn have caves. Sadly, many of the more photogenic locales I passed by on the bus (Like the abandoned barn & Silo directly in a cliff with long waterfall beside and full letter graffiti on the building – DAMN! ), and couldn’t photograph – or wouldn’t, I’m not a fan of sticking my camera at a window and shooting incessantly. P.S. this is a multi bracketed shot and was processed as HDR to try and capture the cliffs since the sun was “setting” just behind the mountain. Posted on Tuesday, June 26th, 2007 at 12:00 am. 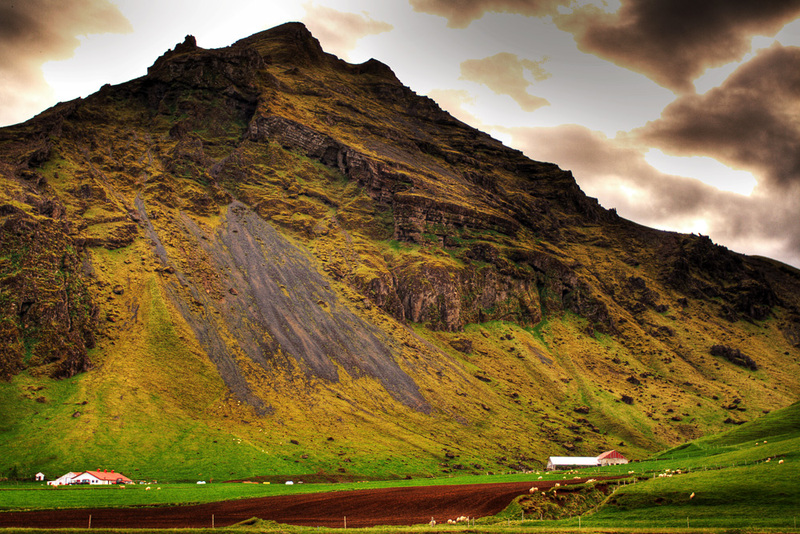 Filed under: HDR, Iceland Tags: Farm, Iceland, Mountain	RSS 2.0 feed. Great job piecing this one together. I can see why the scene caught your eye. Wow. I'm not sure what all that stuff in the P.S. meant, but this picture is wicked! This is so so amazing! I want to frame it. I think i need to.